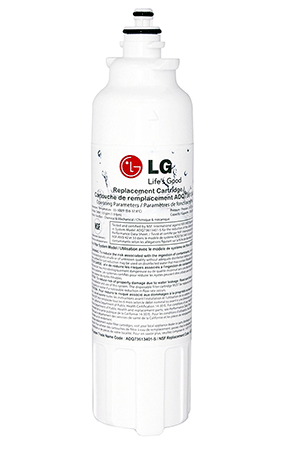 LG is the foremost maker of refrigerators, many of which offer water and ice dispensers. With a filtration system, your water is contamination free and it’s practical in that you can have filtered water on tap without splurging on bottled counterparts. Having a filter in place in the system ensures that the quality of water stays pure and crisp. The M7 filter is 13.8 x 3 x 2.5 inches weighs 1.1 lbs. It can process approximately 300 gallons of water. It is intended to be used in place of the ADQ32617701, M7251242FR-06, ADQ32617703, M7251242F06, and ADQ32617701 filters. This first filter has a super affordable price tag. Since it is used as a generic, users won’t have to dig too deeply into their pockets for this one. This filter is 2.6 x 2.6 x 12.4 inches and weighs 13.6 oz. This filter can process about 300 gallons of water. 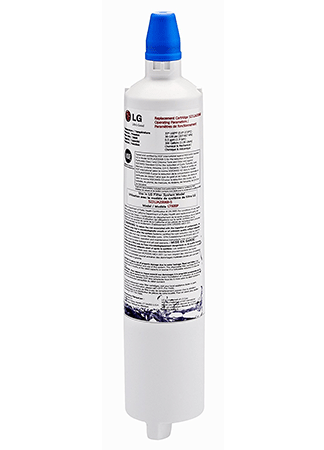 This filter lasts much longer than the M7 and allows water to flow freely through it without becoming easily clogged. 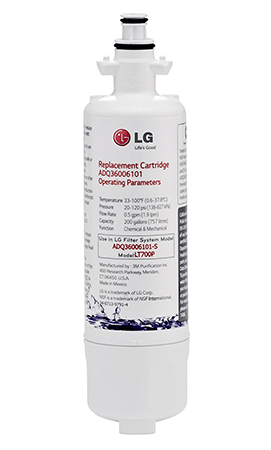 It is also compatible with a huge number of LG refrigerators so purchasers should see their user manuals to make sure this is a fit for their unit. This product is 7 x 1.2 x 0.5 inches and weighs .8 oz. Interestingly, it is not a filter, it is instead used in place of a filter. Many homes have filtration systems outside of their refrigerators, but still wish to use the water/ice dispensing feature. The bypass plug is used instead of the filter so the water functions can still be used. It fits the following units: GRL28ANSPP, GRL28ANQPP, GRL28ANVPP, GRL288NVJP, LFX25976SW, GRL258VSXZ, 71056, GRL288NTXP, LFX25976SB, GRL288NQJP, LFX25976ST, LFX28978SB, LFX28978ST, LFX28978SW, GRL258VQXZ, LMX28988SB, GRL258VVXZ, LMX28988ST, GRL288NSJP, and LMX28988SW. If this is the route taken, it is extremely cost effective. They also tend to last an exceptionally long time. This filter is 6 x 3.5 x 3.5 inches and weighs 11.7 oz. It has a 300 gallon capacity. 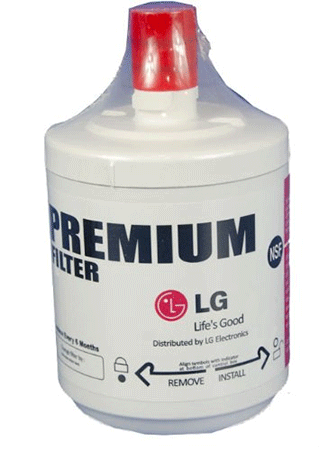 This filter is another money saver, it has an extremely affordable price tag and fits a huge number of refrigerators so users should see their user manuals to make sure this is a fit for their unit. This filter is 12.6 x 4.9 x 2.5 inches and weighs 1.5 pounds. It can process 300 gallons of water. These filters come in a two pack, so with one purchase you are ensuring a year worth of filtration. It works it with a huge variety of side-by-side refrigerator options so users should see their user manuals to make sure these are a fit for their unit. This filter is 1.6 x 1.6 x 6.8 inches and weighs 8 oz. It has a 200 gallon water capacity. 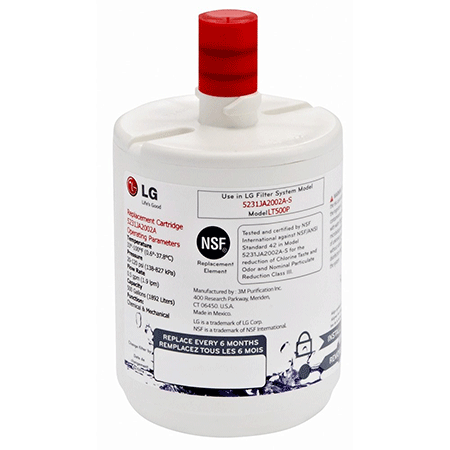 This filter works with the following LG models: LSXS22423W, LMXS30746S, LMXC24746S, LSXS26326W, LSXS26466S, LSXS26366S, LSXS26326S, LSC22991ST, LSXS26326B, LSXS22423S, LMXS30776S, and LSXS22423B. This is another extremely cost effective unit. Most find that it performs all of it’s primary functions perfectly (eliminates odor, no residual debris, etc.). This filter is 2 x 2 x 13 inches and weighs 8 oz. It has a 300 gallon water capacity. Customers can expect this filter to perform all it’s primary filter functions nicely. 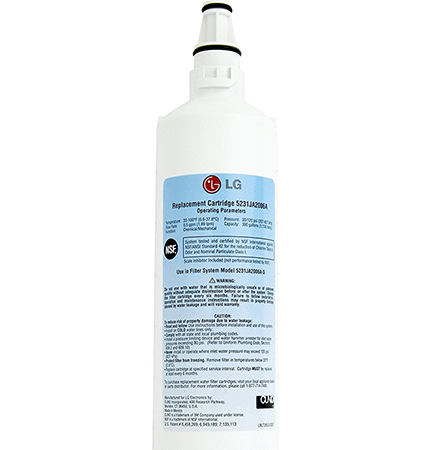 It removes pollutants, odors, eliminates any chlorine taste, etc. It’s price is mid range so it won’t set customers too far back. It works for a huge list of refrigerators, so users should see their user manuals to see if it is a good fit. This filter is 7.8 x 3.6 x 2 and weighs 5 oz. It has a 200 gallon water capacity. In general, this filter is said to fit with most refrigerators up to 7 years ago, but customers should see their user manuals to ensure it will work with their model. 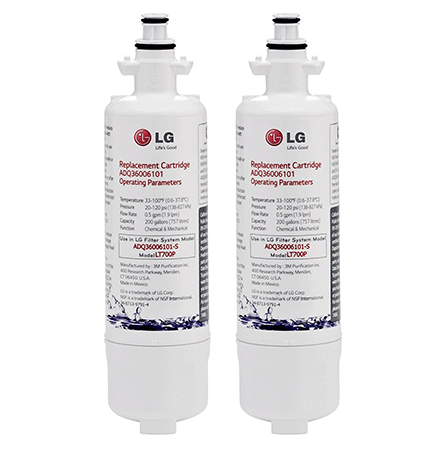 This product comes in a two pack, so people can get a year’s worth of filtration in one swoop. This filter is .4 x .4 x .4 inches and weighs .2 oz. It can process 500 gallons of water. Customers can expect this filter to fit the following models: LFX25973SB, LSC27910SB, LFX25973SW, LFX25974SB, LFX25974ST, LFX25974SW, LSC21943ST, LSC23924SB, LSC23924ST, LSC27925SW, LFX25973ST, LSC27910ST, LSC27914SB, LSC27910TT, LSC27910SW, LSC27914ST, LSC27914SW, LSC27921SB, LSC27921ST, LSC27921SW, LSC27921TT, LSC27925SB, LSC27925ST, and LSC23924SW. This filter has a great price tag with a really high water processing capacity. It does a lot of work without breaking the bank. This filter is 11 x 2 x 2.4 inches and weighs .8 oz. It has a 200 gallon capacity. This is another filter with a great price that also fits a huge list of models. Customers should see their user manuals to make sure it’s a good fit.